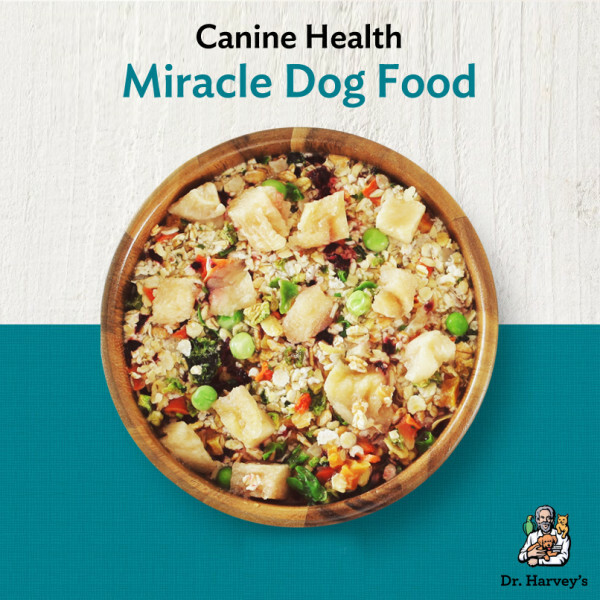 At Dr. Harvey’s, we can’t think of anything more important for your dog’s health than giving them a daily diet of fresh homemade food made from real human grade ingredients. 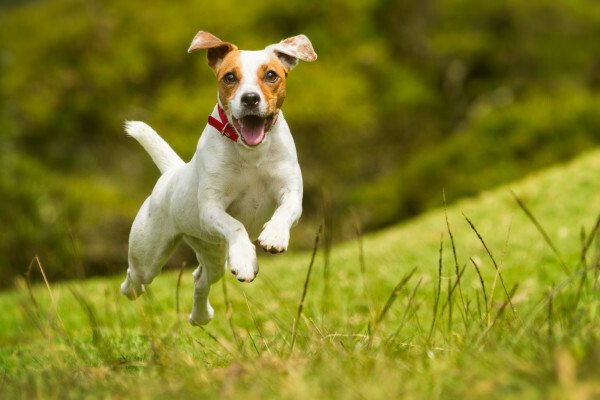 We know that most people have come to believe that dogs should only eat dog food and that feeding kibbled dog food is complete and balanced and healthy. Actually nothing could be further from the truth. Dog food, in particular kibble is made of ingredients that have very little nutritional value and actually kibble is largely responsible for most of the degenerative diseases seen in dogs today. This is true of all brands, even the so-called natural brands high end expensive brands and even foods that are sold as prescription diets. FACT-No kibble provides a healthy diet for your dog. Not only is kibble lacking in the real foods that your pets need, additives are then mixed to the food to allow it to sit at room temperature in stores for long periods of time. Other artificial additives alter the taste of the food so dogs will eat it. Hard to Believe, but True! We understand that this is hard to believe as everyone from your breeder to your trusted veterinarian will tell you that there is “good kibble” and that this type of food is healthy and contains everything that your dog needs. It is unfortunate that so many pet parents actually believe this. A Daily Diet of Crackers? Just like humans, animals derive their health largely from good nutrition. How healthy would you be if you ate a diet of crackers and pretzels that had been filled with preservatives and then sprayed with vitamins, flavoring and coloring agents? And then imagine that this was your only food source that you had day in and day out. This is what kibble is to your dog.-A diet that is lacking in fresh natural ingredients and the essential nutrients that are necessary to keep them healthy and have a long life. We want our dogs to have a life that is free from degenerative diseases such as arthritis, cancer, kidney disease and heart disease. But this type of standard pet food diet in kibbled form can also contribute to allergies, skin conditions, ear infections, digestive problems, bad breath and body odor. Not only does dry kibble lack nutritional value it also lacks enough moisture to keep dogs properly hydrated. Switching to Homemade is NOT Difficult-Really! Once pet parents understand the importance of a truly healthy freshly made meals, it’s a simple decision to switch to a healthy homemade diet. *At first, home cooking can seem overwhelming. *How will I do this? I don’t have time for this? *It must be very expensive. All valid concerns and that’s why Dr. Harvey’s has made home cooking so easy and affordable. *Dr. Harvey’s takes all the guesswork out of making fresh healthy food for your pets. *Using our premixes Canine Health and Veg to Bowl you simply add water fresh meat and oil and you have a fresh meal made from healthy real, whole foods in just minutes. *You will be amazed at how quick and easy it is. *With our foods you will be providing your dog with a healthy homemade diet that they need to maintain the best very of health. *Feeding this way will make a tremendous difference in your pet’s life whether you are starting with a new puppy, supporting your senior dog or trying to help a sick dog regain his health. 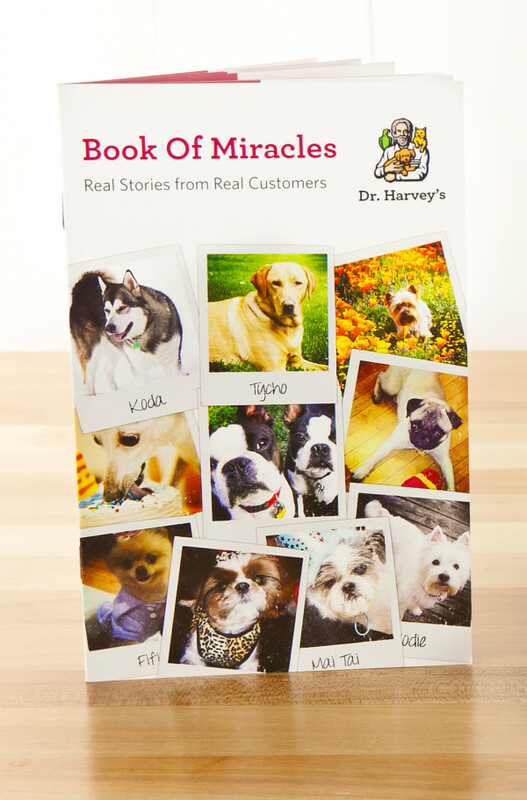 It has always been Dr. Harvey’s mission to help animals find and maintain good health by using only real foods and our natural products. Nothing is more rewarding than hearing from guardians who want to share their companion’s journey of recovery. They want to share their stories not only to say thank you, but also to help other pet parents find a way to help their companions. Many feel they have experienced a miracle. It is our hope that this little book will offer helpful information to those pet parents who need it. These are only a few of the many, many stories that we have received. These letters describe the helplessness that pet parents can feel when they have lost hope of finding an answer for their beloved friends. That hopeless feeling quickly turns into delight, as they see their companion’s health improve. Knowledge is powerful and as you will see from these letters, sometimes just a small change in diet can yield dramatic results. We are happy to share a few of these wonderful stories with you. Once you begin to feed Dr. Harvey’s home made fresh meals you will see the difference it makes and you will never want to feed pet food again. We guarantee it.